Thanks to my current lack of fiberfill, I haven’t had the urge to actually finish much of what I’ve started in the past couple of days. My big surprise is still sitting in unfinished pieces, as are a crochet bunny, a knitted bunny, and a crochet bear. The closest I’ve come to completing anything is putting the hot air balloon together, but minus stuffing the balloon part and stitching it all closed. I think I need to take one of the yarn strands off too, because it’s shorter than the other two, which bugs my perfectionist self. I keep saying I’m going to go down to P & S Fabrics and search for fiberfill (in addition to more yarn! ), but I just can’t seem to motivate myself to walk that far down Broadway and to spend the money. Now I can’t go until Sunday morning at the earliest because it closes super early on Fridays and is closed on Saturdays. I don’t want to spend an arm and a leg on stuffing, but I might just do that and order some online, even though shipping is insane and it won’t be delivered for a few days. I don’t know. I just know that if I go into P & S, no matter how inexpensive it is, I’m going to spend so much money and have so much new stuff for my already large stash. 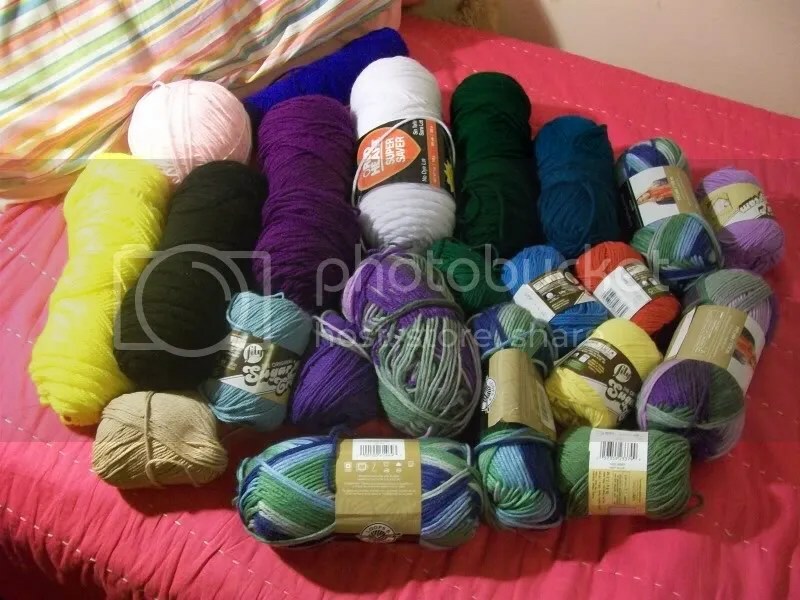 Since I don’t have any suitable finished object photos, here’s my yarn stash to prove that, in reality, I really don’t need anymore yarn, even though I still don’t quite have all the colors I desire. This is my all-purpose yarn. I use it for all my knitting and crocheting. And this is my crochet thread and all of my fuzzy winter yarns. They’re pretty much just an assortment of Lion Brand Homespun, which I absolutely love for scarves and wintery things. I think I might have 12 or 13 skeins in there at the moment. 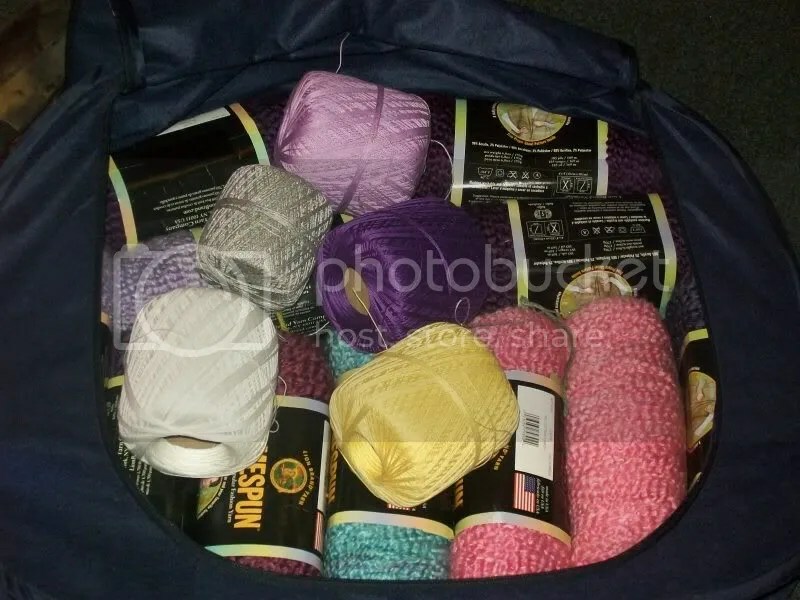 I also have two skeins of a Lion Brand thick navy blue wool yarn, but they just don’t fit in the container with the rest of my stash, so they remain in a bag with knitting needles, unfinished cross-stitches, and other things. I’ll definitely spring them once summer is over and I can comfortably commence with knitting up bunches and bunches of warm scarves/hats/etc.